2. An adaptation of St. Francis prayer--"Make me an instrument of your peace." 5. A prayer to say when you pass the "meat," eggs, and dairy in the grocery store, restaurant, etc. 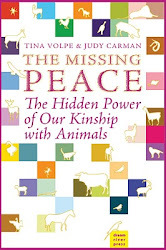 May compassion and love reign over all the earth for all farmed animals—Dear ducks, geese, turkeys, chickens; cows, pigs, lambs, bison, elk, deer, and all of you who are suffering today in tiny cages or crowded into feedlots, being beaten, fed poisoned and unnatural food, and for those of you languishing without water or food on trucks or entering the slaughterhouses. We bear witness to your suffering, we take action to permanently end it, and we continually send out an energy field of love and compassion to comfort you and to transform the hearts and souls of those who support this violent oppression. We send our tears and our prayers on wings of love to you. Compassion encircles the earth for each of you and for all beings. May compassion and love reign over all the earth for all “companion animals” who are suffering at the hands of human beings. Dear dogs, cats, horses, guinea pigs, rabbits, snakes, mice, turtles, birds, ferrets, sugar gliders, frogs, and so many others. We pray for you that you may have peace and joy in this precious life of yours. Some of you want to live free of human interference, and some of you truly want to be part of your human family. We bear witness to your suffering; we do what we can to end your suffering and to encourage others to do the same; and we continually send out an energy field of love and compassion to comfort you and to transform the hearts and souls of those who support the cruelty and oppression of each of you. Our love is all around you. Compassion encircles the earth for each of you and for all beings. Wednesday: Today let us send our prayers to all animals vivisected in laboratories and classrooms. May compassion and love reign over all the earth for all animals used in experiments. Dear primates, dogs, cats, mice; rats, pigs, lambs, rabbits, frogs, and all of you who are imprisoned in cages, tortured in useless experiments, separated from your loved ones, and suffering constant pain, fear, and loneliness, sometimes for many long years. Dear ones, we bear witness to your suffering, we take action to permanently end it, and we continually send out an energy field of love and compassion to comfort you and to transform the hearts and souls of those who support this violent oppression. We send our tears and our prayers on wings of love to you. Our love is all around you. Compassion encircles the earth for each of you and for all beings. 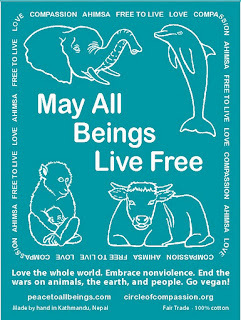 May compassion and love reign over all the earth for all the water beings living in the seas, lakes, and rivers. Dear fish, whales, dolphins, crabs, lobsters, starfish, jellyfish, shrimp, coral, and all the other amazing beings who make the waters of earth their home. Your homes and your very lives are being devastated by huge fishing fleets, by trash, oil, sewage, runoff, and other poisons dumped into your waters, by cutting off your fins, and by capturing you and your loved ones for aquariums and the pet trade. Together, we bear witness to your suffering, take action to end it permanently, and send out an energy field of love and compassion to comfort you and to transform the hearts and souls of those who support this violent oppression. Our love is all around you. Compassion encircles the earth for each of you and for all beings. May compassion and love reign over all the earth for all free-living animals. Dear bears, foxes, cougars, deer, alligators, wild horses, prairie dogs, primates, mink, bison, beavers, elephants, birds, fish, and all the other magnificent beings born in freedom and suffering now at the hands of human beings, living in fear of human beings, and mourning the loss of loved ones who have been tortured and either imprisoned or killed. Together, we bear witness to your suffering, take action to end it forever, and send out an energy field of love and compassion to comfort you and to transform the hearts and souls of those who support the violent oppression of all of you. We send our tears and prayers on wings of love to you. Our love is all around you. Compassion encircles the earth for each of you and for all beings. Saturday: Prayers for animals enslaved in entertainment, such as, zoos, circuses, rodeos, aquariums, theme parks, canned hunts, etc. May compassion and love reign over all the earth for all the beings used in the human entertainment industry. Dear dolphins, whales, horses, bulls, elephants, bears, lambs, pigs, sea otters, fish, elks, deer, rhinos, hippos, alligators, snakes, polar bears, lions, tigers, gorillas, chimpanzees, and all of you who are incarcerated when you want your freedom so much; who remember your parents being killed so that you could be captured; who are forced often with whips, chains, and electric prods to perform unnatural tricks; who are treated without respecting the the dignity of your true nature. Together, we bear witness to your suffering, take action to bring it to a permanent end, and send out our energy field of love and compassion to comfort you and to transform the hearts and souls of those who support the violent oppression of all of you. Our love is all around you. Compassion encircles the earth for each of you and for all beings. May compassion and love reign over all the earth for all the tiny beings who live in the soil, the trees, the water, and the air, creating harmony and balance with your songs, your pollinating of flowers, your graceful flight, your mysterious transformations, and your miraculous ability to literally create soil in which new plants can take root. Dear dragonflies, bees, wasps, butterflies, mosquitoes, moths, beetles, cicadas, crickets, spiders, ants, and all of you who suffer immeasurably at the hands of people who do not understand the miracle of who you are, who poison you, stomp on you, and destroy your homes. You are so small, and many of us who do care about you find ourselves bringing you harm. We ask for your forgiveness and your help and together we bear witness to your suffering, take action to permanently end it, and send out our energy field of love and compassion to comfort you and to transform the hearts and souls of those who support the violent oppression of all of you. Our love is all around you. Compassion encircles the earth for each of you and for all beings. Copyright 2013, Judy Carman and also posted at www.circleofcompassion.org. Let me sow love, for me and for everyone. Let me sow pardon and healing in me and everyone. Let me sow light, the light of transformation. Let me sow joy in myself and all beings everywhere. In Love, Peace, and Freedom. Our meal of love and peace. For no one’s child lies on our plates. None suffered for our feast. And grace to do our part. A prayer to say when you pass the "meat," eggs, and dairy in the grocery store, restaurant, at a friend's home, etc. I see you, and I love you. That's it--simply "I see you, and I love you." I wrote this prayer when someone asked me for a simple, easy-to-remember prayer to use when passing by the pieces of flesh, the gallons of baby cows' milk and all the products made from it, and the eggs from tortured hens. This prayer "I see you, and I love you," came to me from the loving universe. To me, it means-- I see who you really are. Even though I am looking at just a part of your body, I know you are pure spirit. In this moment, I see past the cruelty, the horror, the violence to who you are and have always been. The spirit in me greets the spirit in you. We are connected in love and gratitude. And I love you. After writing it and sharing it, I began using it myself, because it was always so horrible to have to walk by the meat counters and other places where our friends' body parts were being sold. I have to say that it has helped me a lot emotionally and spiritually. Now, instead of scurrying by and trying not to look, I can face these awful places and see what is left of my friends and honor them, honor who they are in truth, show them respect, and let them know, we are with them. We will never give up until they are all free. Thank you for this beautiful and profound site which I will return to again and again for support in my plant-based lifestyle. God bless all animals. I ask to send angels to the suffering, I ask for your pain and suffering to be spared and if not be quick so you don't have to be tortured. I love you all so much. Your not forgotten. You all love in our hearts.